Contains naturally occurring antioxidant vitamins A, B, D & vitamin E, omega 3, 6, 9, minerals & proteins. With a balancing formula of Sweet Almond, organic Castor and Jojoba oils, and Petitgrain and Palmarosa essential oils, this cleansing oil is suitable for normal to oily skins. By drawing dirt and grime from the pores this facial cleanser will leave your skin clean and refreshed, and it's perfect for removing eye make-up including waterproof mascara. Use in combination with our organic muslin cloths which provide gentle exfoliation as well as removing all traces of cleanser and impurities. Comes in beautifully elegant blue glass bottles with black pumps for smooth dispensing. 2. Soak a facial cloth in hand-hot water, wring out, then gently wipe the oil off in downward movements - this is to ensure you wipe the drawn out dirt away from the pores. You may prefer to use a moist cotton wool pad to remove eye makeup. 3. Splash face with cool water, pat skin dry & follow with an application of Blue Labelle facial oil. - A word from Pascale: Hello! I use my cleansing oil in the evening to take off the day's dirt and grime, followed by 4 drops of facial oil applied to my face & neck- you may wish to use less. There's no need for me to cleanse again in the morning - I simply wipe my face with a muslin cloth soaked in hand-hot water to wake up and refresh my face for the day, followed by 3 drops of facial oil. This once daily cleanse should result in the 100ml bottles lasting you just under 5 months, funnily enough your 50ml facial oil will last around the same time following this method! 1. Repeat step 1 above. - Please note that once the pump has been used, a couple of drops of oil may remain in the pump mechanism which, if the bottle is agitated (carried around in a bag for example) these drips may come out of the nozzle and into the plastic cap. Don't worry though- only these couple of drips, if any, will come out. - Replace plastic cap after use. For use around the eyes - take care not to get product in the eyes - if this happens, rinse with clean water. Keep dry, cool & away from sunlight. Prunus dulcis (sweet almond) oil, Ricinus communis (castor) seed oil**, Simmondsia chinensis (jojoba) oil**, Cymbopogon martinii (palmarosa) oil, Citrus aurantium (petitgrain) oil, Limonene*, Linalool*, Citral*, Geraniol*, Farnesol*. *natural constituents of essential oils. **organic. May not be suitable for nut allergy sufferers. 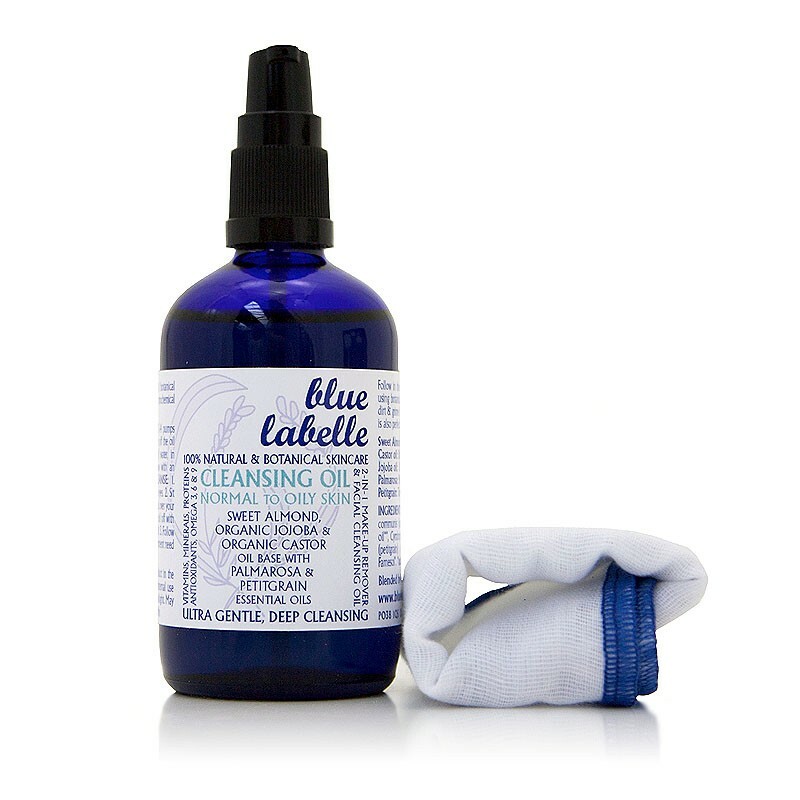 I purchased the trial kit from Blue Labelle which comes with 30ml cleansing oil and 10ml facial oil. Items arrived prompt and packaged well! "I purchased the trial kit from Blue Labelle which comes with 30ml cleansing oil and 10ml facial oil. Items arrived prompt and packaged well! ..."